Always stay united and be guided by the new WMSU banner, Un Universidad, Un Familia, Un Amor.-Dr. Milabel Enriquez-Ho. 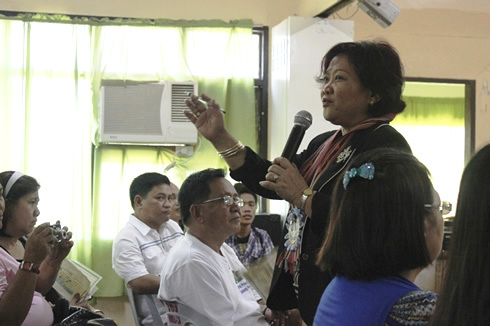 “We are one in support of the College of Agriculture (CAgri) because we know that everything and anything will go back to the soil,” Western Mindanao State University (WMSU) President-Dr. Milabel Enriquez-Ho expressed her support to the said college during the 33rd College of Agriculture Foundation Day. The founding anniversary was held last September 20 and 21 at the WMSU San Ramon Campus of the city. Dr. Ho added, “This [Agriculture] has always been the focus of the Philippine government which is basically an agricultural country.” The two-day event had a series of activities which was participated by the students, faculty members, university officials and as well as the alumni of the institution. With the theme: Makatotohanang Programang Agrikultura, Susi sa Paglago ng Ekonomiya, the celebration started with the ribbon cutting of the new CAgri entrance road followed by the opening program. CAgri Dean-Dr. Eriberto D. Salang gave the welcome address during the program while Dr. Ho rendered a message of inspiration and challenge to the CAgri family and other guests. “We congratulate the alumni for their contributions which strengthen the college through the years,” Dr. Ho lauded the CAgri’s proud and successful graduates as they revisited their beloved college. She also addressed the college as she emphasized on 3 points: (1) to strive to grow more professionally, to aim for more doctorate degree holders and to seek assistance for scholarship outside the school; (2) avoid negativity and strive to be positive; (3) and always stay united and for the college to be guided by the new WMSU banner, “Un Universidad, Un Familia, Un Amor”. During the program, the homecoming alumni were warmly welcomed as their respective batches were recognized. CAgri Faculty Union Club and College Student Board Members were also inducted during the event. Dr. Ho initiated the oath-taking of the different set of officers. On the other hand, Dr. Paterna J. Saavedra-Western Mindanao Agriculture, Forestry and Resources Research and Development Consortium (WESMARRDEC) Techno Gabay Program Coordinator and CAgri faculty member, headed the recognition of Agriculturist Licensure Passers and WMSU CAgri contingent who garnered awards during the recently concluded WMSU Palaro. Certificate of recognition were given to the licensure passers and athletes. The second day of the event started off with a Holy Eucharistic Celebration in thanksgiving of the college’s founding anniversary. It was followed by the Plant Propagation Competition which was sponsored by the CAgri Agritech Department.